How do you become at one with the landscape and follow the animals that live there? Well, BBC Wildlife Magazine spent a day in the woods with Ray Mears and asked that exact question. If you’re interested in learning about tracking and giving it a go yourself, why not take a look at our Woodlore Tracking course, or the Animal Tracks & Signs guide book. 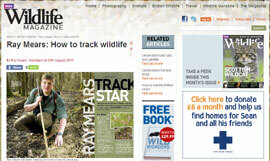 This entry was posted in Bushcraft Tips & Guides, Ray Mears on August 31, 2010 by Woodlore Team. Thanks for the link Woodlore. A few week ago I was in Sweden. I was able to track down a moose and take pictures of it because of the tips Ray Mears gives on TV. Thanks fot that beautiful experiens. Fantastic write up, very informative. It’s nice to see an honest insight into an ancient art rather than a modern interpretation. Thanks for posting the link woodlore. What a great article with some fantastic insight into tracking and Ray’s open views on the principles and humility required. It’s encouraging to know that even those we look up to are still learning and are open to say as such.